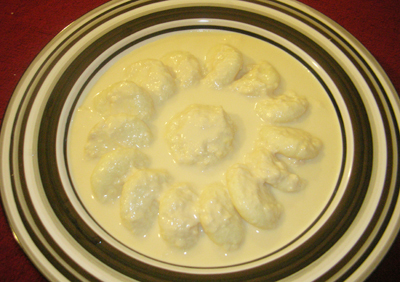 Rosomalai /rasmalai is a unquie Bangladeshi delicacy. This Bangladeshi dessert is flattened cheese ball soaked in malai (clotted cream) flavoured with cardamom. Malai or clotted cream itself has a unique texture. Hope you will love recipe. In the picture you can garnish with pistachio or saffron. But in Bangladesh we do this way simple and unbeatable taste. 1. Now need to squeeze the cheese to extract the water. Make sure the cheese has no excess water otherwise rosogolla will break into pieces. 3. Now divide the dough into 20 equal parts and make them into smooth balls and flatten them. 4. Heat the pan with 7 cups water and add the sugar on medium high. Bring it to boil and add the curd balls to the syrup. Cover the pan with the lid. 5. Need to boil the curd ball 45 minutes but need add ½ cup of water in every 10 minutes. 1. Boil the milk in thick base wide pan on medium heat till it becomes half in amount. 2. Need to stir frequently otherwise it will burn in bottom of the pan. 3. Add cardamom powder and sugar and remove from heat. 4. Squeeze the syrup little bit rasmalai balls before adding in malai. N.B. Normally rasmalai’s malai has a unique texture. To make texture you need to let the milk stuck little bit on the pan base. Then remove it using spatula. But don’t burn the milk. If you are not sure about it, don’t do that. Thank you Apu for the recipe …got everything right in 1st time ….thank you again.